The Lehigh Valley Terminal, 125 Main Street, was the western terminus of the “Route of the Black Diamond” connecting Buffalo to New York through Pennsylvania. When it opened in 1916, the Lehigh Valley was one of four downtown railroad stations, alongside the New York Central and Erie on Exchange Street and the Lackawanna at the foot of Main Street. 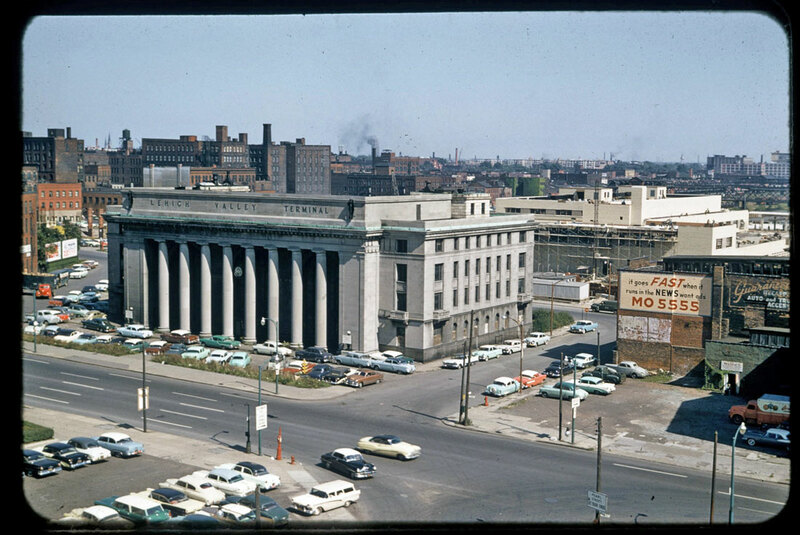 The four-story structure, designed by architect Kenneth M. Murchison, was dubbed a “beauty house for the public” and “monument to Buffalo’s expansion.” Beyond its gray Indiana limestone facade with eight great columns was a white marble-clad concourse, at the time the largest and highest room in Buffalo. The terminal featured a ticket office, barber shop, smoking room, restaurant, and invalids’ room. Modern facilities included an air-washing plant, baggage checks by pneumatic tube, and a sloped tunnel connecting the terminal to the headhouse below Washington Street. The terminal was in use for only 36 years, the Lehigh Valley shuttering the station in 1952 in favor of a new facility at South Ogden and Dingens streets. A proposal by Councilman-at-Large Peter J. Rybka to reuse the Lehigh Valley as an intercity bus station did not advance beyond the idea stage. The Thruway Authority, having acquired the Lehigh Valley’s 4-track mainline for the construction of the I-190, demolished the station in 1960. The Donovan State Office Building was built on the site, and today it is the location of Phillips Lytle LLP and a Courtyard by Marriott.